Skeletal muscles are the organs of the muscular system. They are called skeletal muscles because most of them are attached to bones. A skeletal muscle is composed mainly of skeletal muscle tissue bound together and electrically insulated by connective tissue layers. Individual skeletal muscle cells, called muscle fibers due to their long skinny shape, are wrapped in areolar connective tissue. Muscle fibers extend most of the length of a whole muscle and are arranged in small bundles called muscle fascicles (fah’-si-kuls) that are each surrounded by a layer of dense irregular connective tissue. A muscle is formed when many muscle fascicles are packaged and held together by an external layer of dense irregular connective tissue. Groups of whole muscles with similar functions are connected by a superficial layer of dense irregular connective tissue called fascia (fash’-e-ah). The fascia is deep and connected to the subcutaneous tissue, which is how the muscles can produce skin movement. These muscle connective tissues extend beyond the end of the muscle tissue to form a tough, cordlike tendon, which attaches the muscle to a bone . Fibers of the tendon and periosteum intermesh to form a secure attachment. A few muscles attach to other muscles, dermis, and ligaments, in addition to bones. In these muscles there is a broad, sheetlike attachment called an aponeurosis. (ap”-o-nu-ro,-sis). The internal structure of skeletal muscle tissue is so highly specialized that specific terminology is used to describe some muscle fiber structures. The prefixes sarco- (flesh) and myo- (muscle) are often used in renaming muscular structures. Therefore, the plasma membrane of a muscle fiber is called the sarcolemma (sar-ko-lem’-ah), and its cytoplasm is the sarcoplasm. 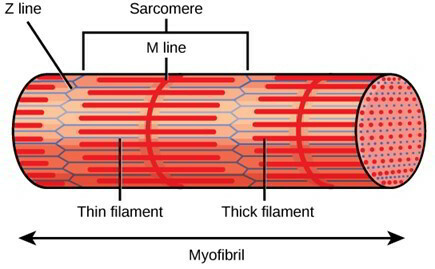 The sarcoplasm contains many threadlike myofibrils, which extend the length of the muscle fiber. Myofibrils are the contractile elements of a muscle fiber. They consist of two kinds of myofilaments that interact to produce muscle contractions: (1) thin myofilaments composed mostly of the protein actin and (2) thick myofilaments composed of the protein myosin (table 7.2). A thin myofilament consists of two twisted strands of actin molecules joined together like tiny strands of pearls. Two additional proteins, troponin and tropomyosin, are present in thin myofilaments and play a role in muscle contraction. Double strands of tropomyosin coil over each actin strand and cover the myosin binding sites. Troponin occurs at regular intervals on the tropomyosin strands. A thick myofilament is composed of hundreds of myosin molecules, each shaped like a double-headed golf club. The myosin heads are able to attach to the myosin bind sites on the actin molecules to form cross-bridges. The organization of thin and thick myofilaments within a muscle fiber produces ttriations-the light and dark cross bands that are characteristic of skeletal muscle fibers when viewed microscopically. The arrangement of thin and thick myofilaments repeats itself throughout the length of a myofibril. These repeating units are called sarcomeres. A sarcomere is a functional unit of skeletal muscle-that is, it is the smallest portion of a myofibril capable of contraction. A sarcomere extends from a Z line to the next Z line. Z lines are composed of proteins arranged perpendicular to the longitudinal axis of the myofilament. Thin myofilaments are attached to each side of the Z lines and extend toward the middle of the sarcomeres. The I band, which is the light band in a micrograph, possesses thin myofilaments only and spans across the Z lines. The A band, which is the dark band in a micrograph, spans the length of the thick myofilaments. Note that the ends of the thin myofilaments do not meet, leaving a space at the center of the A band, which contains only thick myofilaments, called the H band (pale zone). Proteins that maintain the structure of the center the sarcomere make up the M line. The relationship of the sacro- plasmic reticulum and transverse (T) tubules to myofibrils in a muscle fiber. The sarcoplasmic reticulum is the name given to the smooth endoplasmic reticulum in a muscle fiber. It plays an important role in contraction by storing and releasing calcium (Ca2+) ions. The transverse (T) tubules consist of invaginations of the sarcolemma that penetrate into the sarcoplasm so that they lie alongside and contact the sarcoplasmic reticulum. A muscle fiber must be stimulated by nerve impulses in order to contract. Nerve impulses are carried from the brain or spinal cord to a muscle fiber by a long, thin process (an axon) of a motor neuron. A motor neuron is an action-causing neuron-its nerve impulses produce an action in the target cells. In muscle fibers, this action is contraction and the specific type of motor neuron is called a somatic motor neuron. A somatic motor neuron and all of the muscle fibers to which it attaches, or innervates, form a motor unit. Whereas a muscle fiber is attached to only one motor neuron, a single somatic motor neuron may innervate from 3 to 2,000 muscle fibers. Where precise muscle control rather than strength is needed, such as in the fingers, a motor unit contains very few muscle fibers. Large numbers of motor units are involved in the manipulative movements of the fingers. In contrast, where strength rather than precise control is needed, such as in the postural muscles, a motor unit controls hundreds of muscle fibers. Whenever a motor neuron is activated, it stimulates contraction of all the muscle fibers that it innervates. Neighboring muscle fibers do not contract due to the insulation provided by the connective tissue coverings. 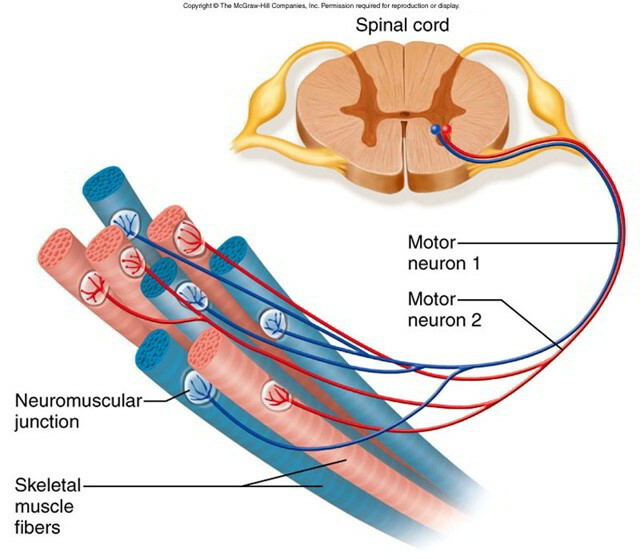 The part of a somatic motor neuron that leads to a muscle fiber is called an axon. 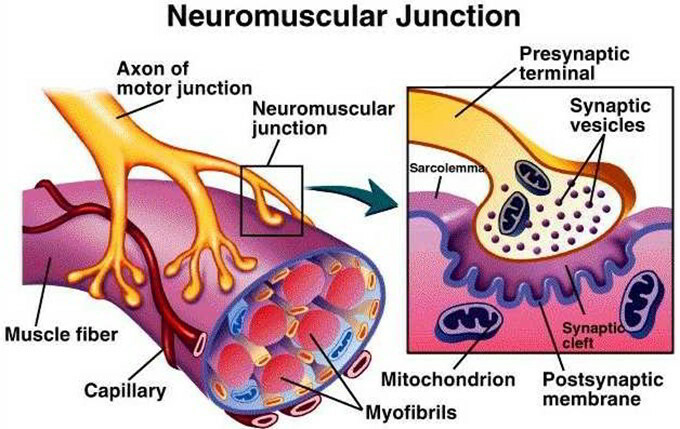 The connection between the terminal branches of an axon and the sarcolemma of a muscle fiber is known as a neuromuscular junction. The terminal boutons (axon tips) fit into depressions, the motor end plates, in the sarcolemma. The tiny space between the terminal bouton and the motor end plate is the synaptic cleft. Numerous secretory vesicles in the terminal bouton contain the neurotransmitter (nu-ro-trans’-mit-er) acetylcholine (as”-e-til-ko’-len) or ACh. When a somatic motor neuron is activated and a nerve impulse reaches the terminal bouton, ACh is released from secretory vesicles into the synaptic cleft. The attachment of ACh to ACh receptors on the motor end plate triggers a series of reactions causing the muscle fiber to contract. Neuromuscular transmission represents a prototype for synaptic transmission. At the neuromuscular junction, an action potential carried along the axon of an a-motor neuron releases acetylcholine (ACh) into the synaptic cleft. ACh diffuses across the synaptic cleft and binds to nicotinic receptors on the end plate region of the skeletal muscle cell. An action potential is initiated in the skeletal muscle cell, which is transduced to an intracellular Ca++ signal that triggers muscle contraction. a-Motor neurons are large, myelinated fibers that originate in the anterior horns of the spinal cord. An axon can branch at its terminal and innervate multiple muscle cells. A muscle cell, however, receives only one synapse. This means that a muscle cell is dependent on a single motor neuron for activation, providing great specificity for muscle control. In contrast, a given motor neuron can innervate multiple muscle cells, allowing a coordinated response of larger muscles. The motor unit consists of the motor neuron and all the muscles that it innervates. The number of muscle fibers making up each motor unit determines the degree of control of contraction that is possible. Small motor units allow fine control, such as the muscles of the hand involved in writing. Large motor units coordinate the response of large muscles, such as the muscles of the leg used for lifting. The neuromuscular junction, or motor end plate, consists of a nerve terminal that rests in a trough on the muscle cell surface called the synaptic trough. The membranes of the two cells are separated by a 20 to 30 nm space called the synaptic cleft. The neuron is considered to be the presynaptic cell, and the muscle cell is the postsynaptic cell. The presynaptic nerve terminal contains approximately 300,000 synaptic vesicles that contain the neurotransmitter acetylcholine. The sides of the presynaptic membrane contain voltage-activated Ca++ channels. The synaptic region of the presynaptic membrane is called the active zone because it is the site where ACh is released. The synaptic gap spans the distance between the presynaptic and postsynaptic membranes. Acetylcholinesterase, which degrades ACh into acetate and choline, is found in the synaptic cleft.The postsynaptic membrane is part of the muscle cell end plate region and contains numerous ACh receptors. Vesicles arrive at the axon terminal and are loaded with acetylcholine. An action potential in the presynaptic neuron depolarizes the nerve terminal. Depolarization activates voltage-sensitive Ca++ channels in the active zone, and Ca++ enters the axon terminal. The influx of Ca++ activates calcium/calmodulin- dependent kinase and leads to translocation of vesicles to the presynaptic membrane, where they dock. After docking, fusion proteins bind Ca++ and prime the vesicles, and the vesicle contents are released by exocytosis. The ACh diffuses across the cleft and binds to ACh receptors on the muscle membrane. The ACh receptor channels open, and ion movement creates a depolarizing end plate potential. ACh dissociates from the receptor, and the channel closes. ACh is broken down to choline and acetate in the cleft. Choline is transported into the terminal in an Na+- dependent secondary active transport process. Membrane that was added to the terminal membrane during exocytosis is taken up and reused to form new vesicles. Approximately 200 vesicles fuse with the membrane at the active zone and release ACh into the cleft during excitation of the motor neuron. Each vesicle contains approximately 10,000 ACh molecules.These numbers become important in describing the both the efficiency of neuromuscular transmission and also the characteristics of neuromuscular diseases. Neurotransmitter vesicles are assembled in the cell body of the neuron and transported by kinesins along the axon microtubule system to the axon terminal. In the terminal, the vesicle is acidified by an H+-ATPase. Acetylcholine is then transported into the vesicle in exchange for H+. Drugs that disrupt microtubules, such as paclitaxel, can cause temporary paralysis owing to a reduction in the number of synaptic vesicles. ACh vesicles in the axon terminal can be at the active zone, ready for exocytosis, or away from the active zone in the cytosol. Cytosolic vesicles must be translocated to the active zone, dock with the membrane, and be prepared for fusion (primed) when needed. The SNAP-SNARE mechanism mediates vesicle exocytosis. Synapsin 1, synaptobrevin, SNAP-25, syntaxin, synaptotagmin, and synaptophysin are proteins involved in vesicle translocation and exocytosis. Intracellular Ca++ enters during depolarization, and following repolarization Ca++ exits the cell. Repetitive depolarization causes an increase in intracellular Ca++ in the terminal, and thus facilitates vesicle release in response to subsequent excitation. Prior to activation by depolarization, numerous vesicles are docked and primed, allowing for maximal release upon the arrival of an action potential. The quantity of ACh released is greater than what is required to generate an action potential in the skeletal muscle cell, thereby creating a “safety factor.” The excess release of ACh normally ensures that nerve activation leads to muscle activation. The amount of ACh released with each action potential decreases as more action potentials invade the nerve terminal. The decrease is due to the time required for new vesicles to be positioned at the active zone and fully primed. Consequently, the safety factor decreases with high-frequency stimulation, but in normal individuals no loss of function is observed. The skeletal muscle end plate region has a high density of nicotinic ACh receptors. This ACh receptor is an integral membrane protein consisting of five subunits that form a cation-selective ion channel. Simultaneous binding of 2 ACh molecules to the receptor protein opens the channel, allowing Na+ and K+ to diffuse across the membrane. The same protein functions both as the ACh receptor and the channel—no signal transduction is required. The ACh receptor channel conducts Na+ and K+ with equal ease. Normally, a channel that conducts only one ion shifts the membrane potential toward the Nernst potential for that ion. Opening a K+ channel shifts the membrane potential toward -90 mV, and opening an Na+ channel shifts the membrane potential toward +60 mV. The skeletal muscle ACh receptor conducts both ions equally, and opening the channel shifts membrane potential at the end plate region of the skeletal muscle toward the arithmetic average of the Na+ and K+ Nernst values, about -15 mV. The binding of ACh to the muscle cell ACh receptors causes depolarization. The amplitude of the depolarization is dependent on the number of functional receptors and the percentage of the functional receptors bound by ACh. ACh is released from the axon terminal in packets of 10,000 molecules, the amount in one vesicle. Release of one vesicle causes a 0.4 mV depolarization of the skeletal muscle end plate region, called a miniature end plate potential (MEPP). MEPPs occur spontaneously at neuromuscular junctions and are thought to be due to unstimulated exocytosis of single ACh vesicles. Normal neuromuscular transmission causes the release of up to 200 vesicles, and that amount of ACh causes a 75 mV depolarization, from the resting membrane potential of -90 mV to -15 mV. This depolarization is an end plate potential (EPP). Depolarization of the muscle end plate to -50 mV is sufficient to activate voltage-sensitive Na+ channels in the muscle cell membrane and induce an action potential, so the normal 75 mV depolarization provides a safety factor ensuring that each neuromuscular transmission causes depolarization and contraction of the target skeletal muscle. ACh is rapidly cleared from the synaptic cleft by acetylcholinesterase. This process ensures that continuing ACh receptor stimulation depends on continuing release of ACh from the motor neuron. Sustained contraction, or tetany, depends on sustained activity of the motor neuron. EPP amplitude is not constant but is dependent on the amount of ACh in the cleft and number of functional nicotinic receptors in the postsynaptic membrane. Action potentials that are close together in time increase EPP amplitude through a process known as facilitation. Facilitation is enhanced ACh release due to increased priming of vesicles by Ca++ in the presynaptic terminal. Increased ACh concentration in the cleft leads to a larger than normal EPP. Facilitation plays a role in normal activation of muscle but is most noticeable in patients with decreased numbers of functional nicotinic ACh receptors. In these patients, initial attempts to activate a muscle lead to weak contractions. Continued use facilitates the release of ACh, which partially compensates for the decreased numbers of receptors, and contraction strength improves. The size of the EPP increases as motor neuron action potential frequency increases. A high-frequency stimulation that yields a maximal EPP is called a tetanic stimulation. During a normal contraction, muscle cells are stimulated by the innervating motor neuron at a tetanic frequency. The extended series of motor neuron action potentials leads to posttetanic potentiation. Following high-frequency stimulation, a subsequent action potential in the motor neuron evokes an EPP that is larger than normal owing to enhanced release of ACh. At the other extreme, high-frequency stimulation for prolonged periods can lead to transient depletion of primed ACh vesicles near the membrane and depression of neuromuscular transmission, or synaptic fatigue. Depression is rarely observed in normal individuals under voluntary control. However, it is routinely observed in some diseases of the neuromuscular junction, such as myasthenia gravis. A number of toxins and drugs affect the ACh receptors at the neuromuscular junction and induce flaccid paralysis. Curare, d-tubocurarine, and gallamine block the nicotinic channels from opening and induce flaccid paralysis. These agents are used for relaxing skeletal muscle during surgical procedures. Succinylcholine is an agonist of the nicotinic ACh receptor, but it is not degraded by AChE. Therefore, it causes prolonged depolarization of the muscle end plate and inactivation of the fast Na+ channels, leading to elevation of threshold in the muscle cell and relaxation. Elapid snake venoms (krait and cobra) contain a-bungarotoxin, a curarelike drug with high affinity for the ACh receptor. The skeletal muscle action potential is similar to the motor neuron action potential except that it is longer in duration and does not exhibit a hyperpolarizing afterpotential. The long duration of the muscle action potential allows time for mobilization of Ca++ and activation of actomyosin ATPase.